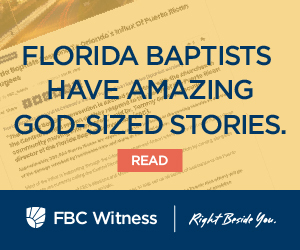 The Florida Baptist Convention is a network of churches that span the state, with a staff team whose sole purpose is to come right beside Florida Baptist churches and pastors. Our dedicated staff team serves in every region of the state and is committed to advancing the Gospel in our state, our nation, and our world. We are governed by a Board of Directors made up ordained and lay leaders whose main purpose is to implement decisions made by the votes of Florida Baptists at our annual State Convention meeting.